Bamboo is a great looking flooring option that has additional benefits for a sustainable world. 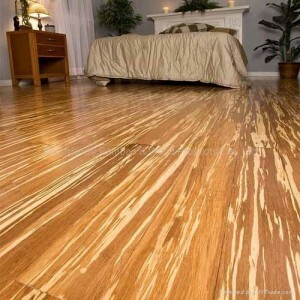 Bamboo flooring is a wood flooring product made from the Bamboo plant. This type of flooring has been called eco-friendly flooring as Bamboo is actually a grass and so grows much quicker, matures faster, and can be harvested without killing the plant. This means that harvested bamboo will grow again without needing to be replanted. The bamboo used in Bamboo Flooring will grow and mature in 4 to 5 years. This is a stark contrast to traditional hardwood flooring that is produced from Oak, Maple, and other hardwoods that can take 30 to 150 years to mature and need to be replanted when cut down. The bamboo used in Bamboo Flooring is primarily Moso Bamboo which can grow up to 4 feet a day or close to 80 ft a month. This quick regeneration is what makes this type of flooring better for the environment than traditional hardwood flooring. The root structure remains intact after harvesting allowing the plant to grow back without replanting. Bamboo matures in 3 to 5 years which means up to 20% of a bamboo forest can be harvested each year to produce a sustainable harvest rotation cycle. As a final benefit bamboo grown in its natural habitat does not require watering, fertilization, or pesticide spraying. As Bamboo grows quickly and regenerates itself many people have started calling this an eco friendly solution to give the look of hardwood without having to cut down old growth hardwood trees which take decades or even centuries to mature. While this all true there are some not so eco friendly aspects of bamboo that consumers should be aware of before buying bamboo specifically for its eco friendly features. There is a problem though that hurts Bamboo Flooring’s eco friendly reputation - transportation costs. Bamboo for Bamboo Flooring grows primarily in China. For us in North American the bamboo needs to be transported across China, the pacific ocean, and finally to your home. This is not a short trip and definitely has a negative impact on the environment. There is also the issue of the manufacturing process which uses binding agents such as urea-formaldehyde to join the bamboo strips into planks of bamboo used for flooring. There are strict regulations around what can be used but as the plank is made up of many thin pieces and adhesive is required unlike traditional hardwood. In recent years manufactures have started producing the flooring without formaldehyde to address one of the main concerns eco friendly buyers had with the flooring. You can find several formaldehyde free flooring options in today’s marketplace. When looking for an eco friendly flooring solution bamboo definitely has what it takes from a sustainability point of view. It is fast growing, does not require replanting, and can often be grown with little irrigation, fertilization, or pesticide use. This is fantastic and if bamboo grew naturally in North America it would be a very eco friendly solution. The environmental cost of transporting bamboo across China and the Pacific Ocean cannot be ignored though and should be considered when looking to make your home eco friendly.